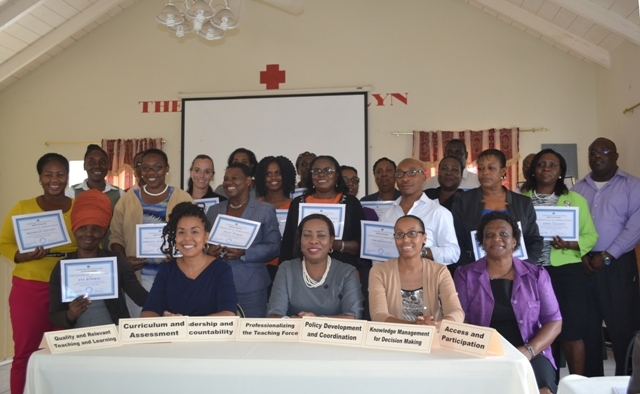 NIA CHARLESTOWN (MARCH 29, 2016) — St. Kitts and Nevis Ministry of Education held its first consultation session on strategies for the Education Sector Plan at the Red Cross Conference Room in Nevis on March 23, 2016. The Plan is expected to be completed by September-October 2016. 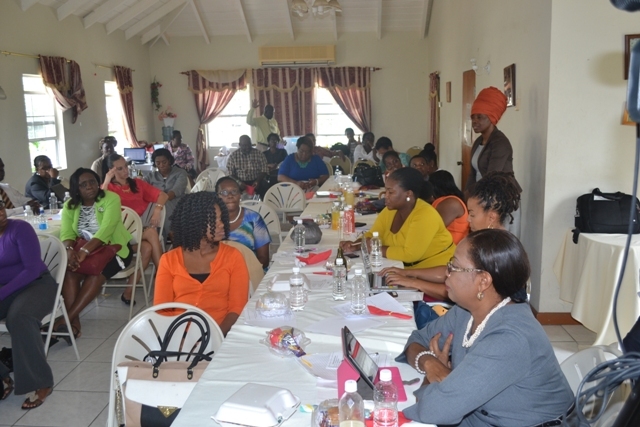 The consultation was the last of the seven working sessions held for the development of these strategies by Education Officials of both St. Kitts and Nevis. National Coordinator for the Education Sector Plan Development Dr. Neva Pemberton said, based on the discussions at the consultation, it would appear that peoples’ impressions of the strategies presented by working groups were in line with issues identified in the diagnosis of the education system. During the session, programme development working groups came together for the first time to discuss the preliminary set of strategies developed in previous sessions. A member of each group presented strategies developed in Programme areas, which include Curriculum and Assessment, Quality and Relevant Teaching and Learning, Leadership and Accountability, Professionalizing the Teaching Force, Knowledge Management for Decision Making, Access and Participation, and Policy Development and Coordination. Corresponding activities and those responsible for implementation were also reflected in these strategies. The strategies are designed to work toward the three overarching policy goals guiding the development of the medium-term education sector plan in the Federation. The policy goals are formulated to improve equitable access to and participation in education at all levels; to strengthen the quality and relevance of education to improve learning outcomes; and to enhance governance, plan, and management to enhance efficiency and effectiveness throughout the sector. At the end of the session, each participant was presented with a Certificate of Appreciation from the St. Kitts and Nevis Ministry of Education. Also present were Permanent Secretary in the Premier’s Ministry Mr. Wakely Daniel, Education Planner for St. Kitts and Nevis Mr. Quinton Morton, Permanent Secretary in St. Kitts and Nevis Ministry of Education Mrs. Ionie Liburd-Willet, Senior Assistant Secretary in St. Kitts and Nevis Ministry of Education Mrs. Eleanor Phillip and Education Officials from the Department of Education in Nevis.